In which we summarise what is known about the migration of my g.g. grandmother Susannah Mary Boulding and her younger brother Apsley Samuel Boulding to the United States. This summary reveals a few questions. It also introduces the surnames of Spence and Hampson to the list of Backler-descendants. As we have seen in the two previous posts, my g.g. grandmother Susannah (nee Backler) Boulding, then Cross, re-married after the disappearance of her first husband James Boulding, and was found in 1861 living with her second husband Edwin J Cross, and the unfortunate surviving offspring of this marriage, Edwin J F Cross. But what of Susannah’s two surviving children of her first marriage? Was it just part of normal circumstances of the day, or had these two been forced to flee the nest after the appearance of their new step-father and step-siblings? Susannah’s mother Mary (nee Pellatt) Backler had died in 1857, the family having survived bankruptcy in the 1830s and, despite her wealthy Pellatt/Maberly origins, seeming to have fallen on rather straitened times. And so, Susannah Mary Boulding, aged 16, was found in 1861 as a nurse to the large and growing family of wealthy surgeon Mitchell Henry, whose biography can be seen at https://en.wikipedia.org/wiki/Mitchell_Henry . With the death of his father in Manchester in 1862, Mitchell Henry gave up his career as a surgeon and – presumably – his home in Wimpole Street, and removed to Manchester and the home of the family business. He later became a politician, and built Kylemore Lodge, now a convent, in Connemara, Ireland. Question: did young Susannah stay in service with this family, or seek another post in London, or move back to be with her mother? Even younger, Apsley Samuel Boulding, unlike his many Pellatt and Backler ancestors, does not seem to have been apprenticed out, but was in 1861 a warehouse boy in Tooley Street, Southwark, just south of the river Thames. Question: what happened to young Apsley after the great fire of 1861 almost certainly destroyed the warehouses where he worked? under the names of [difficult to read, but possibly] A W Crawford, a merchant said to be of Germany, and ‘Marie’, listed as a male but almost certainly his wife. Above Susan’s name are two other servants, both of Great Britain: Robt Taylor, 30; and Hy [?] Wickham, 27. I have tried searching all these people in the 1870 US Census, without success. I have not found Susannah in that census either, but what we do have is the record of her marriage to William Spence in October 1870. They were married in St John’s Church, Staten Island, by the Rev John C Eccleston, Rector. Witnesses were Thomas Solomon and Edith Eccleston. Rev Eccleston was Rector off and on for about 50 years. In the 1870 Census, Thomas Solomon was a 40 year old Sexton, born in Ireland. Had he known William Spence prior to the marriage, or was he a witness of convenience? The marriage took place a year before the consecration of the new church, which was heavily financed by Cornelius Vanderbilt. How had William and Susannah met? We do not know whom she was working for when she arrived in America. However, we know that William was already working for the employer he would serve until his death – Theodore Kane Gibbs, or his family. In the 1870 Census, William Spence was to be found at the Gibbs family home in fashionable Newport, Rhode Island, where the family spent their summers. He was said to be aged 40, born in England [sic], and a domestic servant. In all records after this, he is a Coachman, and in my next post I will give much more detail about him and the Gibbs family. We have never found when William came to the USA, nor is his age accurately known. In the 1870 Census he was said to be 40, presumably a guess by whoever filled in the census return. At his marriage, also in 1870, he gave his age as 34, giving a birth year of 1836. Elsewhere, family lore says he was born in Stewartstown, Northern Ireland, in around 1832. Suffice to say that we don’t actually know! Helpfully, but so far bringing us no closer to information about William’s ancestry, are the names of his parents – William Spence and Mary Hutton – given on the marriage certificate. This is an ongoing search. For the moment, we will leave Susannah and William, and summarise what we know of her brother, Apsley Samuel Boulding. There are two records of immigration for Apsley Boulding. The first is on 4 April 1870, aboard the Aleppo, into Boston. Apsley Boulding is said to be a Farmer, aged 22. In theory, Apsley should appear on the US Federal Census, taken on 1 June 1870, but I cannot find him (nor, as stated above, his sister). But…there is a second possibility: In his US Naturalisation declaration in 1888, he states that he arrived in March 1873, which is corroborated – sort of – by a Canadian immigration record showing the arrival on 17 June 1873 of A S Boulding, aged 25, a Labourer destined for Montreal, on The Peruvian from Liverpool. Was this Apsley? There is no record of a border crossing into the USA. As shown in our post about Apsley’s half brother, Edwin J F Cross, hospital records indicated that Edwin’s brother was in Canada. Question: Did Apsley travel twice across the Atlantic, first to Boston, then presumably returning to England and subsequently voyaging to Canada, from which he went to New York City? Whenever and wherever he arrived, we know the broad details of his life until his death in 1925. He married Francine [aka Francena or Francenie] Hampson (c. 1861 – 1937) in 1880. She was descended from hatmakers in Stockport, England. In his 1888 naturalisation declaration, he was a ‘Waiter’, but by the 1900 Census they are found in Newark NJ, where he is a Superintendent – Club. In 1910, Apsley is a Steward in a country club in Lancaster PA. Living with them is her 14 year old niece, Ethel Telford. By the 1925 New York Census, the couple are living on East 92nd Street in New York City, with no occupation. 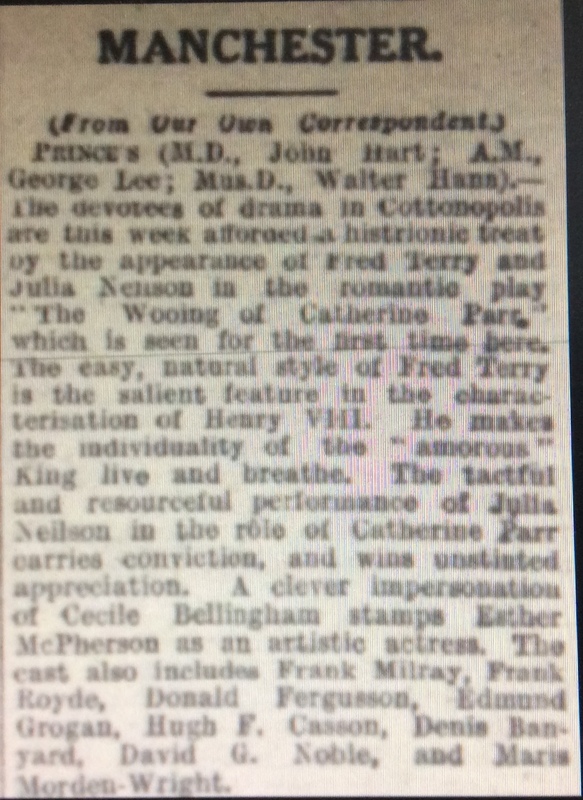 This was just before Apsley’s death on 12 February 1926, followed by Francenie’s death ion January 1937. There were no known children of this marriage. In my next post, I will try to summarise what I know about the Newport and New York City lives of The Spence/Boulding marriage. This will bring us into recent memory. In future posts I may digress, to describe the Pellatt/Maberly/Meriton lines. Jane Ozella Backler was christened on 17 February 1795 at St Ann Blackfriars, near to Apothecaries’ Hall, where her father Sotherton Backler was soon to become Clerk to the Society of Apothecaries. Children in previous generations of this family had also been given the name of Ozella – I am not sure why. Two siblings had died before her birth: Thomas (1786-1786) and Elizabeth (1789-1791). I have never found any further information about brother Benjamin, christened in 1793. Her three surviving half siblings were about 15 years old when Jane Ozella was born, and she had four surviving older full siblings. Her birth was to be followed by that of Thomas Osborne Backler (1796-1796), whose name perhaps indicates the name of Hannah Osborne’s father (not confirmed), and Sotherton Backler (1798-1875), whose life as a vicar in Northamptonshire we have reviewed in a previous post. Jane Ozella’s mother Hannah Osborne would die when she was about 8 years old, leaving her most likely in the care of her older siblings while their father became Clerk to the Apothecaries. Marriage to Daniel Burton: Jane Ozella Backler married Daniel Burton at St Clement Danes Church on 9 October 1827. He was a widower, of that parish, while she was of the parish of St Mary Islington, where in a previous post we have seen her sister Mary [nee Backler] Sudlow lived at about that time. Possibly Jane Ozella was living with the Sudlows? Witnesses were Mary Ann Burton and a Burton whose name I can’t read, and Sam’l Backler (Jane Ozella’s older brother and my 3x G Grandfather, reviewed in many previous posts). Daniel Burton was a Publisher, born in 1790 in Hounsditch, and previously married and widowed. Jane Ozella’s early death: Daniel’s marriage with Jane Ozella was to be sadly short-lived, as she would die in 1830, perhaps in childbirth. Jane Ozella Burton was buried on 20 November 1830 at Bunhill Fields Burial Ground, where her parents had been interred before her. On 7 December 1835, the twice-widowed Daniel Burton would marry again, to Juliana Maria Willats (1785-1869). I can identify no children from this marriage. He died in 1876. Jane Ozella Backler and Daniel Burton had one child: Sarah Ann Burton, born 1 September 1828 and baptised at Fetter Lane Independent Chapel on 10 October 1828, the family being of the parish of St Andrews Holborn. Sarah Ann Burton, or Sarah Ann Mayes as she would become, obligingly appears in every English census from 1851 to 1911. Frustratingly, I cannot locate her in the 1841 census, when her father appears with his new wife, but not with his daughter who would have appeared as aged 12 in that census. Sarah Ann Burton marriage to John Mayes, 1853: By 1851, Sarah Ann Burton is to be found in Olney, Buckinghamshire as a teacher in a Ladies’ Seminary, said to have been born in Holloway, London. It is here that two years later we find a record of a marriage registration with John Mayes (JUN quarter Newport Pagnell, 3a 564). 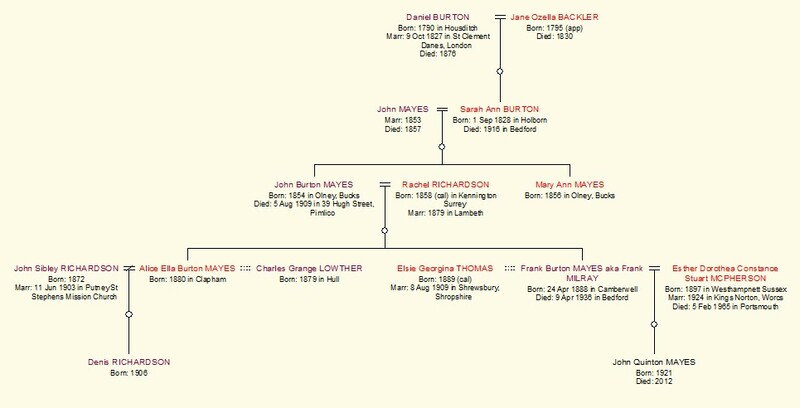 This short-lived marriage was to produce two children, before John Mayes died in 1857 – at least I deduce that fact from the two deaths of ‘John Mayes’ registered in that year, one in Newport Pagnell Union in Sep quarter (03A 319, age 42) and one in Bedford in Dec quarter of 1857 (03B 21, age 61). Could these be father and son? Hard to tell, since we don’t know how old John Mayes was when he married Sarah Ann, although I think it may be safe to assume that he was the 36 year old John Mayes, Tailor, living on High Street, Olney, Bucks, in the 1851 census, born in Olney, and therefore about 42 by the year of the deaths noted above in 1857. 1861 and 1871: The widowed Sarah Ann Mayes was living in Bedford by the time of the 1861 Census, where she appears as a schoolmistress. widow, with her two young children. In 1871 she is living at 13 Western Street in Bedford, as the Proprietor of a Ladies’ School. As well as a number of pupils in residence, we find her 80 year old father Daniel Burton, a retired publisher. In 1871, daughter Mary Ann Mayes is found as a pupil in Hanwell, Middx, but I cannot find John Burton Mayes in this census. 1881 – 1916: Still on Western Street in 1881, Sarah Ann has been joined by her daughter Mary Ann, also a teacher, where they are to be found in 1891, along with Sarah Ann’s 10-year old grand daughter Alice Ella Burton Mayes, a pupil about whom scandal will unfold further down this page! By 1901, 72 year old Sarah is living on her own in smaller premises on Bower Street, now a Teacher of Needlework. Mary Ann is to be found as a servant in Hampstead. In 1911, Sarah Ann was living on her own in Almshouses at 31 Dame Alice Street in Bedford, where she presumably lived until her death in 1916. She was not entirely on her own – her widowed daughter-in-law Rachel Richardson had also moved to Bedford by this time. 1.1 Alice Ella Burton Mayes (1880 – ?) was born in 1880, and apparently lived with her parents until her marriage in 1903 to John Sibley Richardson (1872 – ?) (who was not, as far as I can see, related to her mother Rachel Richardson). John Sibley Richardson variously cites his birth country as Staffordshire and Warwickshire, probably because his birthplace, Harborne, is a village, a parish, and a sub-district in the district of Kings-Norton and county of Stafford. The village stands near the boundaries with Worcestershire, Warwickshire, and Birmingham borough, 3 miles SW of Birmingham. Such places often find themselves designated in different counties, depending on border configurations. Scandal and divorce: And here our story takes on a hint of scandal. In the 1911 Census, we find at 43 Braemar Avenue, Wood Green, North London, the couple Alice and John (he is an Automatic Slot Machine Dealer), and their 5 year old son Denis Richardson (1905 – ?). I had thought I had lost touch with them after that until, in preparing this post, I came across his divorce petition against her, which can be seen on Ancestry. In brief, Alice apparently left John S Richardson in autumn 1911 to take up residence in Notting Hill Gate and elsewhere with Charles Grange Lowther (1879 – ? ), an artist born in Hull in 1879, who had won scholarships for his art studies. In 1912, John S Richardson petitioned for divorce from Alice, which was finalised in 2013, with him apparently taking custody of the young Denis. Meanwhile, Charles G Lowther’s wife also petitioned for divorce in 1912, citing the relationship between Alice and Charles. I had thought there that the trail ran cold, BUT, there is recorded on 13 October 1912, the arrival into Montreal, Quebec, of Chas G Lowther, artist, 33, and his ‘wife’ Alice E Lowther…from that point on, I can find no trace. Nor can I find a certain ending for John S Richardson. Oh my. I have just rescued myself from a near-amateur error. I had recorded ‘our’ Denis Richardson as the one who died by torpedo in the Atlantic in 1942, but NO! More detailed checking of registered births and mothers’ surnames on the GRO website reveals that the torpedoed Denis’ birth was registered in 1906 to a different mother’s surname. His birthdate is given on his 2nd Mates’ certificate, confirming that he is indeed not ‘ours’. ‘Our’ Denis’ birth was registered in 1905, and he disappears like his father after the 1911 Census and the subsequent divorce. End of story for the moment! 1.2 Frank Burton Mayes (aka Frank MILRAY) (1888 – 1936) Born 24 April 1888 in Camberwell. Frank married first Elsie Georgina Thomas (?1889 – ?) on 8 August 1909 in Shrewsbury, Shropshire. Elsie’s mother Ethel had been widowed by the time of the 1891 Census, when Elsie was 2 years old. In 1911, Elsie and Frank lived at the desirable address of 15 Chaucer Mansions, Queen’s Club Gardens, West Kensington. Both were aged 22, she born in Worcestershire, Longden, and Frank in London, Denmark Hill. He designated himself as an actor. And there Elsie’s trail runs cold! Mar qtr 1922: Mayes John Q. Mother’s surname McPherson. Wandsworth 1d 1097. Annotated at bottom of page: Mayes, John Q. Mother surname McPherson. Wandsworth 1D. See Sept ’24. Sep qtr 1924: McPherson John Q. AND Mayes John Q. Both names appear in the printed lists, both have mother surname as McPherson and are now referred to as Wandsworth 1d 1009. Mar qtr 1960: Mayes John Q. Mother surname McPherson. Wandsworth 5D 1116. Phew! Since I can’t find out what happened to Elsie Georgina Thomas Mayes, I can only surmise that she and Frank Burton Mayes aka Milray separated, or that she died. Frank Burton Mayes married (2) to the actress Esther Dorothea Constance Stuart McPherson in the June quarter of 1924, in Kings Norton, some three years after the first registered but much amended registered appearance of John Quinton Mayes. Without ordering all the various certificates, it is difficult to unpiece the story, but it seems little John was first registered in his mother’s surname, and then had it amended to that of his father – at least we assume that John Burton Mayes aka Milray was little John Quinton Mayes’ father! Frank Milray; 1888-1936, (born Mayes) actor and printmaker, as an actor he toured with the the Alexander Marsh Company 1922-24 and Julia Nielson Fred Terry Company all over the country, painting and sketching as he toured. He married Esther McPherson (1897-1965) they had a son; John Mayes (1921-2012), John acted with the well-known Shakespearean actor-manager Donald Wolfit. In 1928 Frank retired to ‘The Willows’ Pavenham, Bedfordshire. About this Item: The Willows Presse, Pavenham, Bedfordshire, 1924. No Binding. Condition: Fine. Limited Edition. Six original linocuts of Pavenham, handprinted by the Bedfordshire actor and artist Frank Mayes, working under the pseudonym Milray, at his home, Willow Cottage, using the imprint, ‘The Willows Presse’. Each shows a street view of the village, and are hand-printed on beige paper. The prints are numbered 1 – 6, First Series, and all but one are signed in pencil, and dated 1929. Print sizes vary, but are approx. 15 x 10cm, 13 x 16cm, 13.5 x 11.5cm, 14.5 x 12cm, 12.5 x 17.5, 14 x 13cm. Each print has been recently remounted on cream card, with the original backing card retained (each bears a printed slip with an impression of the artist’s house, and the wording “Handprynted by Milray at the Willows Presse, Pavenham, Bedfordshire” Underneath is a small panel with the wording “Pavenham Village 1st Series” and the handwritten number (1 to 6). Frank Mayes used the name Milray as an actor from the early 1920s and when signing his work as an artist. When he was not engaged as an actor on tour throughout the UK he lived in Pavenham, from 1923-1931, after which he and his family moved to the neighbouring village of Stevington until his death in 1936. The original portfolio which contained these prints is present, although in very poor condition. It bears the same imprint as the prints, but at the bottom is hand-written, “6 Mounted Proofs”, suggesting that these were the very first printing of each linocut. The prints themselves are in fine condition, and are most attractively done. Signed by Illustrator. Seller Inventory # 005912. The John Mayes Family Papers, circa 1879-1970s, document the lives and lengthy careers of three generations of British actors, writers, and artists. Among the primary family members were brothers Herbert Pearson (1866-1955, born McPherson) and Quinton McPherson (1871-1940); Quinton’s daughter Esther McPherson (1897-1965) and her husband Frank Milray (1888-1936, born Mayes); and the son of Esther and Frank, John Mayes (1921-2012). John Mayes, who acted with the well-known Shakespearean actor-manager Donald Wolfit, brought together his family’s papers with his own, including his research and notes about the family. And there we leave the last batch of descendants of the children of Sotherton Backler and his wives Fran Harris and Hannah Osborne – except, of course, for my direct line descended from Samuel Backler (1784 – 1870) and his daughter Susannah Mary Backler (1817 – 1883), to which we will turn in the next post.